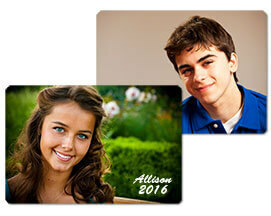 Our wallet photos are professional studio quality, and we guarantee that you will be happy with your prints. We have answers to the most common questions below, but if you need additional help please feel free to contact us with a phone call or email. You can give us a call Mon-Fri from 8am to 6pm, and on Saturdays from 10am to 6pm (Central Time). Send us an emailI Call us at 1-888-562-7970, or locally at 913-648-0871. How long does it take to get wallet photos printed? We print wallet orders within one day and ship them out fast! Can I order my senior student's wallet size photos online? Sure! We offer our professional quality wallet photos online. Start your wallet photo order online here. How fast are wallet photos order printed and shipped? We ship most wallet photo orders within one day. What are the shipping charges for wallet print orders? The charges vary according to the size of your order, but usually run between $5.95 and $6.75 per order. Priority Mail (2 to 3 days) is available starting at $15.60, and Express Mail 1-2 delivery starting at $29.00. Do I have to separate the wallet photos from the sheet myself? No - we die cut your photos and deliver them to you ready to use, already removed from the sheet. What size are the rounded corner wallet photos? The printed size is 2.5" x 3.5" - the die-cut does remove about 1/16th of an inch	all the way around. Can I get my name on the wallet photos? Yes. The cost is $5.00 per order if you use the same text on each picture. See our name imprint fonts & colors here. How do I add the name imprinting to the wallet photos when I order online? If you want your name printed on the wallet photos simply tell us in the 'Special Instructions' box during checkout. You'll see the 'Special Instructions' box in the next step after you choose your print sizes and quantities, and you'll see it again during the checkout process. Can I get my senior pictures retouched before the prints are made? Sure! We offer 'simple retouching' starting at $5 per image that includes acne and other minor blemishes, as well as full retouching for images that require more work. If you want your images retouched just tell us what you would like done in the 'Special Instructions' box before you checkout. Can I combine my wallet size print order with the rest of my senior picture prints? Sure, you can order whatever size prints you like at the same time you place your order for your wallet photos. Can I order matte, glossy and metallic finish wallet prints mixed in the same order? Yes. If you want to order prints with mixed finishes (matte, glossy, metallic etc.) in the same order you will need to select 'All' under the product list drop-down tab on the print ordering page. When you set the product list to	'ALL' you can order mixed print finishes within the same order.